Two New Demo's & a vote of confidence! 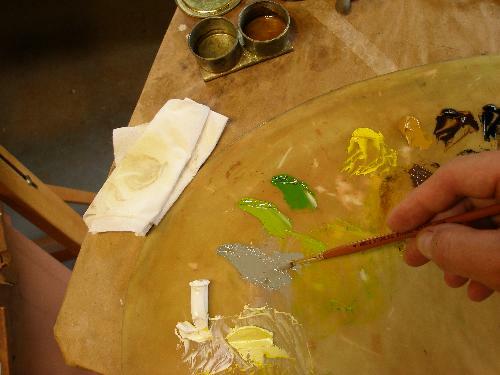 A while ago, we added a page that talks about Alla Prima painting. After writing it, I realized that the explanation was a bit wordy, and most artists, including me, learn better visually. With that in mind, I've done a demonstration to explain this oil painting technique better. With the addition of the FAQ (frequently asked questions) section, I hope I've helped folks in answering some of their most burning questions. If you have something that you can't find on the site, or would like demonstrated and explained, post your question right here! Here's one of the more recent submissions. Where are the dew drops? This demonstration shows how to achieve those very subtle changes in color and tone with blending. It's a fairly long demonstration, so get that cup of coffee before you start. 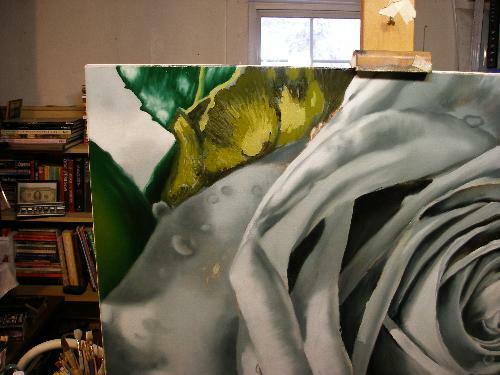 Check out this demonstration on Painting Roses and how to do some very serious blending work! Jewels from the submissions section. Some of my readers have really been kind and generous! There have been such great photo's added that make for some really great painting subjects. Where to put your great photo's! Now this next bit of information has me bustin' at the seams with excitement! Let me share with you some of his success and thank him again for being generous enough to post his work here! It's about a fellow artist Paul, out in Henderson, NV here in the great US of A that has submitted a wonderful painting in our "Your paintings" section of the site quite some time ago: Pensive Beauty has now been submitted to a art exhibition! Check it out right here and don't forget to vote! 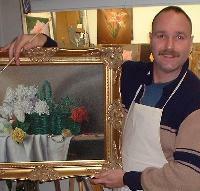 Got Paintings? Put em right here and let others enjoy them! Who knows where it might lead to. I have suggested in the drawing section of the site several books and e-books for beginners to help them with their drawing skills. Remember, painting is drawing with a brush, and until you have a grasp of this, your paintings will suffer. I've found a great course that both for beginners and even experienced artists will improve your skill set. It is one of the most comprehensive courses I've seen in drawing available. It is geared primarily for portraits, (which is a most difficult genre) and because it talks a great deal about technique, these skills can be crossed over into all areas of your drawing. And these skills will be then be transferred to your paintings! Every so often, something comes along that simply put, boosts your confidence to new heights. As artists, we strive to produce the best work that we can, and when this hard work is appreciated and acknowledged, it really puts high octane gas in your tank to continue to do what you love. This recently happened to me when a fellow artist reviewed my e-book, and has published her findings. 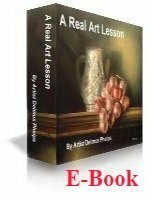 Check out what this accomplished artist has to say about "A Real Art Lesson". For those that have thought about getting this, don't sit on the fence too long! My web guru adviser has told me that the sale has to end sometime, otherwise, it isn't a sale! On or around June 15th, we will see a price increase on the e-book, so don't wait too long to still get it at the lower price! you can get the e-book for it. A Tablet is a hand held reading device like the "Kindle", that allows purchases of books that can be read virtually anywhere! I don't think you will find a better bargain for this complete art lesson including the photos!